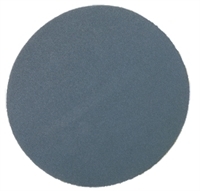 PSA Backed Self Adhesive Sanding Discs. Applications: PSA (Pressure Sensitive Adhesive) backing can be applied to a wide range of the abrasive materials in stock. This has a peelable film enabling the adhesive to fix securely to the rotating disc base. The advantages of this method of fixing is that it is very secure, with little chance of slippage, and provides a relatively rigid base compared to grip (Velcro) backed, which is slightly cushioned. This make it better suited to higher precision applications and to tool sharpening. Paper: Aluminium oxide, zirconium, silicon carbide. Cloth: Aluminium oxide, zirconium silicon carbide, ceramic. These discs are made to order (approx 10 w/days). Please contact us with your requirements and we will be pleased to quote. Also Available: Other discs we can make to order include plain backed and grip backed.